Directs the overall entertainment function and associated activities either personally or through subordinate supervisors. Oversees the assignment of duties, responsibilities and workstations to employees observing and evaluating those employees and work procedures. Approves personnel actions such as new hire requests and discharges. Serves as a master of ceremonies for shows and events presented by the Cruise Director's Divsion by taking part in skits and/or simple dance routines. Oversees all entertainment presentations, activities and qualty in all venues. Hosts and participates in shipboard recreational, entertainment and social programs geared toward adults and families. Serves as master of ceremonies to motivate, inform and entertain small and large groups of guests. Socializes with guests in public areas at all times and visits guest lounges at specified times to converse with as many guests as possible in the time alloted. Participates and hosts family activities, assists the tour front desk, back office, ticket processing and dispatching of tours. Participates in shows and events presented by the Cruise Director's Division by taking part in skits and/or simple dance routines. Instructs, organizes and facilitates various activities and/or tournaments. Responsible for the operations and maintenance of cruise ship's Interactive Television System, tactical maintenance of communication systems onboard including but not limited to Satellite Systems (C-Band, Inmarsat A, B, C, M), Mini-M, Mobilecomm Call Router, Call Accounting, etc. Monitors system performance and provides first level support to maintain maximum uptime of all systems mentioned above. Coordinates satellite feeds, editing, shooting, graphics and video productions for onboard television system and produces live special events and video shows. Selects pre-approved movies, satellite or local television stations from which programs will be recorded or transmitted and selects videotaping equipment on which program will be recorded. Serves as master of ceremonies in various lounges or nightclubs. Operates music, lighting and video equipment to produce a mixture of dance music and video clips for a variety of categories such as, but not limited to, classic top 40, dance oriented rock, Latin, classic disco, reggae, and classic rock. Maintains up to date musical inventory for a variety of categories. Maintains and supervises music playing equipment. Serves as master of ceremonies in various lounges or nightclubs. Participates in shows and events presented by the Cruise Director's Division by taking part in skits and/or simple dance routines. Instructs, organizes or facilities various activities and/or tournaments. Operates spot light equipment for production shows. Responsible for the programming, operation and maintenance of the lighting, show control and fog/haze systems in certain entertainment venues aboard the ship for a variety of events and activities. Responsible for programming, operating and maintaining all aspects of the show lighting, show control and haze/low fog systems in various entertainment venues for rehearsals, shows, special events and other activities. Meets with guest entertainers and certain groups to find out what their lighting-related requirements may be for upcoming rehearsals, shows or activities. Responsible for the operation and maintenance of all aspects of the sound system(s) in certain entertainment venues aboard the ship for a variety of events and activities. Operating and maintaining all aspects of the sound system(s) in various entertainment venues for rehearsals, shows, special events and other activities. This person is also responsible to assist with and oversee the set up, positioning and strike of microphones, audio snakes and cables, headphone amplifiers, stage monitors and other equipment for all applicable rehearsals, performances, events and activities along with its care and storage. Routine maintenance responsibilities include cleaning all air filters on applicable amplifiers, equipment rack cooling fans and other equipment at least once per month, and testing for any failure in the signal chain as well as for blown speaker drivers at least once every two weeks. Patch cord and bay maintenance required. Manages the theatrical aspects of all onboard presentations particularly the Production Shows. Maintains the artistic standards and intentions of the Producer, Director and Technical Designer. Manages maintenance program and is responsible for all technical spaces. Coordinates production plans and directs activities of stage crew and performers during rehearsals and performance. Establishes and oversees all showroom sound and light pre-sets, cast pre-sets, stage crew pre-sets and all post performance “put-away.” Acts as Stage Manager during shows, operate rigging show control console and call cues to stage crew. Assembles and disassembles equipment and props for all shows and activities in the Cruise Director's Division. Able to read stage layout specifications and blueprints and confer with Stage and Production Manager to determine type and location of sets, props, scenery, lighting, and sound equipment required for specific event. Gathers, transports and disassembles props and equipment. Positions lighting fixtures on and around stage area, clamps light fixtures to supports, connects electrical wiring from fixtures to power source and control panel, positions sound equipment on and around stage area, and connects electrical lines to power source and mixing console. May operate sound console and/or light boards equipment. Pulls cables that raise and lower scenery, curtains, and equipment and operates lighting and sound equipment during rehearsals and performances, following audio or visual cues. Imagine spending your morning maintaining equipment, afternoon rehearsing our flying shows, and the evening being a part of the production. Work in the most state of the art theaters and become one of our team of experts. This position is responsible for all content, usage and designated users of shipwide digital signage system and also for the library and quality of on-demand videos and other media content used on the Interactive TV system. In addition to other requirements, potential candidates should have a minimum of three years television broadcast & production experience, including graphics creation and operation, video editing, shooting, producing, program scheduling. Chief administrator & operator of shipwide digital signage system. Schedule & manage content for shipwide digital signs. Maintain library of content for digital signage system. Assign privileges to designated users. Load and monitor on-demand video & media content for ITV system. Directs all the casino operations and associated activities throughout the vessel by either personally performing specific duties or through subordinate managers and supervisors. Directs the overall casino and gaming function onboard. Creates an entertaining gaming environment which intrigues, attracts and retains the attention of the guests. 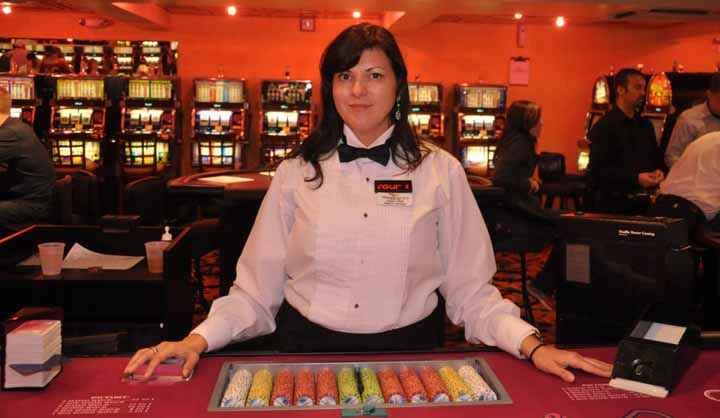 Oversees the assignment of duties, responsibilities and workstations of Casino employees, observes and evaluates employees and work procedures. Mentors, develops and provides on the job training to subordinates. The Casino Host’s major function is to own all aspects of strategic relationships with Casino VIP’s, and to drive additional incremental gaming revenue from these relationships. As a member of the casino marketing and operations team, you will be the first line of contact with High Value guests and act as an ambassador for the casino. Casino Hosts will Identify high value players, enroll players into Club Royale, builds relationships with new and current players, The ideal candidate for this position will possess inherent customer service skills, a passion for customer care, and a commitment to proactive service and recovery as necessary to engage and WOW our casino guests. Conducts all Casino gaming table games such as Blackjack, Dice, Roulette, Let It Ride, or Stud Poker and other related table games in the shipboard Casino by performing the following duties. Exchanges paper currency for playing chips or tokens, ensures wagers are placed before table gaming proceeds. Accurately maintains the handling of cards, dice, chips, money and other gaming equipment. Installs, services, adjusts and repairs coin-operated slot machines, currency changers, video arcade games and currency and coin-handling equipment located in the shipboard Casino by performing the following duties and responsibilities. The position is also responsible for maintaining and repairing signage and the computerized gym equipment. Adjusts slot machines, video games, coin-handling, card shuffling and all other machines and equipment following manufacturer's specifications, using hand and power tools. Conducts general maintenance and/or service on all machines and equipment. Prepares requisitions for parts, tools, equipment, etc. Fills machines with coins and test electrical and coin-handling systems. Examines defective machines to determine causes of malfunctions. Adjusts and repairs machines, replacing worn or defective electrical or mechanical parts, using hand tools, such and screwdrivers and pliers. The candidate should have two years cash handling experience in a customer contact position within the casino, hotel, banking or related industry. The candidate should also have the ability to count chips and paper currency quickly and accurately and should also be able to operate coin counters, chip mechanism, 10 key adding machine and related equipment. Greets guests and provides Casino information regarding cashiering services available to the guests. Exchanges chips, cash, coins, checks, credit and/or other monetary notes. Accurately counts chips, cash, coins in a quick and efficient manner. Receives coins or casino chips from guests requesting paper and/or coin currency equivalency. Operates electronic coin counter or counts chips to determine correct exchange values. Provides guests with paper currency and/or coin equivalency. Obtains approval for credit card transactions; charges individual accounts for chips issued; maintains Credit Card Log.